That some Greyhounds make excellent therapy dogs, visiting hospitals, senior care centers and other facilities. Their long legs make them just the right height to lay a head on a hospital bed or nudge a hand. Their size and temperament also make some Greyhounds good service dogs, especially as balance dogs. That Greyhounds have few health problems, being naturally hardy and requiring little grooming. Their fine coat makes grooming minimal, but the fine coat and little body fat leaves the hounds susceptible to winter’s chills and summer’s heat. White Greyhounds may also be prone to sunburn. That the Greyhound’s specialized physiology is a big advantage on the field or track but can cause problems when he needs medical treatment, particularly if the dog needs anesthesia. Because Greyhounds have little body fat, they metabolize chemicals like anesthetics slower than other dogs. Greyhound owners should seek veterinarians who are experienced in treating sighthounds. That relative to body size, the Greyhound’s heart is not only larger and more efficient than any other dog breed’s, but it outperforms that of a thoroughbred racehorse. During a 30-second run at top speed, a Greyhound’s entire blood volume is circulated through his body four or five times. That everything about the Greyhound says “speed” – long legs, slim head, long tail, deep chest, fine coat, unique “hinged” spine. That in 331 B.C., Alexander the Great, King of Macedonia, owned a Greyhound. After his Greyhound, Peritas, died in battle, Alexander ordered a state funeral for him and named a city after Peritas, his brave and loyal Greyhound. That smiles are powerful communication tools not only for our interactions with other humans but also with canines? Dr. Emily Weiss decodes this behavior. A smiling dog is a dog communicating comfort – “no fight” - and affiliation. Your smile can really make a difference to a stressed dog. Taking the time to smile can help communicate to the dog “all is OK”. When smiling at a dog, a soft, closed-lip smile is better than showing your teeth. Human responses to seeing a photo of a dog “smiling” tend to be to soften our eyes, pull back our lips and relax our foreheads. Canine smiles range from a soft, long-lipped relaxed eye to a more squinty eye, relaxed forehead, relaxed ears and beyond. Mouths can be open or closed (many show their front teeth). Many dog smiles have the same characteristics of human smiles. Smiling benefits both humans and canines. Pass it on. Skin condition can have numerous causes. Your Greyhound may be allergic to either food or environmental factors such as dust, pollen, or mold. Fleas, lice and mites can cause mild to severe skin irritation. Pets with too much or too little of certain hormones are prone to skin problems. Bacterial infections can cause skin problems. Symptoms of skin conditions are (a) itching, scratching, licking or rubbing; (b) red patches, spots or pimples; (c) scabs, crusts or thickened skin; (d) hair loss; (e) flaky or scaly patches; and (f) bad skin odor. If your pet is showing signs of skin irritation, consult your veterinarian who will be able to diagnose the condition. Greyhounds are creatures of habit. Notice how your dog anticipates and acts on certain cues in your daily routine, like going to her kennel when you pick up your briefcase or running to the kitchen when you ask your fur kids if it’s time to eat. Having stability and routine give a Greyhound a feeling of security. That is why Greyhounds experiencing major changes in their daily routine – like moving from a foster home to a lifletime home or welcoming a new Greyhound to a family with other pets – can sometimes require a little extra attention to minimize stress and anxiety. That there does not appear to be a seasonal trend in canine influenza like there is in humans. There is now a vaccine for canine influenza, but it is not among the recommended core vaccines. The vaccine tends to reduce the severity of symptoms, but it does not totally prevent the illness. Additionally, most dogs get a mild form of canine flu, so the mortality rate is low. Secondary bacterial infections leading to pneumonia can be more of a problem, but those cases are treated with fluids and antibiotics. Fever and a yellow nasal discharge are signs that your dog should see a veterinarian. Very young dogs, senior dogs and dogs with chronic health problems are more susceptible to serious infections. Other precautions for your dog, if a canine influenza outbreak is noted in your area, include: (a) minimizing contact with unknown dogs; (b) scheduling grooming appointments early in the day and picking up your dog as soon as possible; (c) if possible, arranging for a pet sitter instead of boarding your dog; and (d) if you handle or are around other dogs, using hand sanitizer before handling your own dog. Ask your veterinarian about the need for vaccination for your dog – the decision will depend on factors like your dog’s health and lifestyle. If your dog is coughing, it could be caused by a number of different canine respiratory pathogens. Special diagnostic tests can be done to determine which respiratory infection your dog has. A dog with canine flu is generally free of the virus and no longer contagious by a week after the initial symptoms appear. If you have any questions about canine influenza or the vaccine, speak with your veterinarian. That many holiday foods can be harmful to dogs, causing a slight upset stomach to severe vomiting and diarrhea. Avoid giving your dog fatty or spicy foods, bread dough, fresh herbs, alcoholic beverages, caffeine and any kind of sweets, especially those with chocolate or xylitol. Particularly dangerous can be poultry bones. Cooked bones splinter easily and bone shards can cause choking, getting stuck in your dog’s gums or damage the intestines. As always, discourage your dog from foraging in the garbage – secure the lids on all trashcans. It’s natural to want to share your holiday treats with your pets, but do not overdo it. A few small bites of turkey or sweet potatoes should do the trick—without making your dog sick. Enjoy a safe holiday season. That when guests arrive, you can help your dog contain his excitement and be calm. Exercise him prior to the festivities. After 30 minutes of walking or playing, your dog will more likely be relaxed. As a general rule, don’t let your dog greet unfamiliar guests since unusual activities and commotion can cause him additional stress. It is also a good idea to use a baby gate or put your dog in another room or his crate while answering the door. Give your dog a break from the initial hubbub. You don’t want your greyhound to escape through the door while welcoming a guest. That will really put a damper on a party. Allow him to rejoin the festivities after all the guests have arrived. Pets stressed by unfamiliar events typically pant more, so keep your dog’s water bowl filled with fresh water during the holidays. That some vets are interested in essential oils’ possibilities for use with dogs and are experimenting with them in disparate ways, from using lavender in waiting and exam rooms to sooth dogs, for odor control, when doing light massage, and in other ways. The top 12 essential oils that can be used effectively on dogs are: Cardamon, Chamomile, Frankincense, Geranium, Ginger, Helichrysum, Lavender, Marjoram, Niaouli, Peppermint, Sweet Orange and Vetiver. Check it out with a registered aromatherapist or your vet. That dogs have 42 teeth. According to the American Veterinary Dental Society, approximately 80% of dogs over age 3 have some degree of dental disease. Dogs’ teeth are awash in bacteria-rich plaque, which, when combined with minerals in saliva, hardens into tartar that traps even more bacteria. Left unattended, your dog’s gums can become inflamed, resulting in gingivitis and periodontal disease. Oral bacteria in your dog’s mouth can enter your dog’s bloodstream and cause damage to the heart, liver, kidneys and lungs. Most plaque builds up on the cheek side of your dog’s teeth, so when you brush, concentrate there. Life Saved – Opening your heart and home is an important part of saving a life. Fostering a Greyhound is one of the most direct ways you can help. That the magazine, Celebrating Greyhounds, will give the adopter of a senior Greyhound (over 7 years of age) or a special needs Greyhound (a Greyhound with a special medical problem) a free issue of the magazine. Send a note to Editor at editor@adopt-a-greyhound.org describing the dog’s special need or age, name of the adoption group or other source of adoption, the adopters name and mailing address. That teaching a foster Greyhound basic manners through positive reinforcement is a greyt investment in her future. That Greyhounds are the blood donors of the canine world. Greyhounds have more red blood cells than other breed and many are universal donors. Greyhound blood donors save many lives by donating blood to save the lives of pets everywhere. That fostering helps a Greyhound reveal her true personality in a safe and loving environment and gently exposing her to people, animals, places and things will better prepare her for a life with her new family. Distemper Warning For Pet Owners In Collin County City. The city of Plano is dealing with a distemper outbreak. Officials with animal services say the problem is one of the worst ever dealt with in the Pet owners are being warned to get their pets vaccinated, as the viral disease appears to be spreading through the Collin County raccoon population. “In the last three weeks we’ve picked up approximately 50 raccoons that all have been sick and dying from this virus,” explained Plano Animal Services Manager Jamey Cantrell. While distemper symptoms include fever, vomiting and seizures, many of the infected raccoons appear to be calm. “These guys can, whenever they’re sick with this, they can actually be friendly to people. They can allow people to pick them up,” Cantrell said. The distemper virus in animals is similar to the one that causes measles in people. But the canine distemper virus is not contagious to humans. Both dogs and cats are in danger since raccoons can be infected with both the canine and feline strains of distemper. In addition to getting pets vaccinated, Plano residents are being warned against leaving pet food outdoors and advised to keep their pets away from wildlife. That TAGS is always interested in your feedback. Please let TAGS know Greyhound-savvy vets, pet setting services, dog daycare, grooming services and other services that you recommend. TAGS would also like to have new pictures of your Greyhounds for its Very Happy Hounds slide show. Everyone wants to brag about their Greyhounds!!!! Please email those to TAGS. Check out the Greyhound Information page for currently recommended vets and the Greyhound Friends/Links page for other current recommendations. That veterinary acupuncture is used to treat a variety of conditions in dogs. Acupuncture may be defined as the insertion of needles into specific points on the body to cause a desired healing effect. Electricity, heat, and low power lasers may also be used. Acupuncture is indicated mainly for functional problems such as arthritis, vertebral disc pathology, noninfectious inflammation (such as allergies), some skin problems and gastrointestinal problems. Acupuncture can assist the body to heal itself by affecting certain physiological changes including stimulation of nerves, increase of blood circulation, relief of muscle spasm and release of certain hormones. The length and frequency of acupuncture treatments depends on the condition and the method of stimulation used by the veterinary acupuncturist. Veterinary acupuncture is offered by Dr. Sharon Wild at The Colony Animal Clinic. Contact the clinic at (972) 370-5220 for more information. That fish oil is one of the most beneficial additives to the canine diet. It is excellent for treatment of canine allergies, arthritis, high cholesterol. Flax seed oil and olive oil are both great sources of antioxidants and are key for maintaining canine cardiovascular health. Check with your vet to determine the proper amount to give to your dog. Other commercial pet seasonings and toppings are: Puppy Dust (puppydust.com), dogpeople Souplements (dogpeopleinc.com), Bingo-Mega Essential Green Buffalo Tripe and Pharynx Food Topper ( bingopettreats.com) and Himalayan Dog Food Seasoning (himalayandogchew.com). That the following are unsafe foods for dogs: avocado, caffeine, candy, chocolate, cooked bones, grapes, Macadamia nuts and onions. Easy, healthy toppings to spice up your dog’s food are: canned pure pumpkin; canned sardines or mackerel; crumbled bacon or turkey bacon, ground beef, chicken, turkey or lamb; ground up liver treats; nori; spirulina; and yogurt. Additional low-prep topping ideas are: grated carrots, sautéed zucchini, steamed and diced frozen veggies (except corn); grated low sodium cheeses and veggie, chicken or turkey stock (low sodium). (Hint: freeze stock in an ice cube tray for use cube by cube.) However, remember that adding toppings to your dog’s food also adds calories to your dog’s diet. That there are new warnings about illnesses and deaths in dogs that eat jerky treats made in China. The most cited brands are Waggin Train – Jerky Tenders and Canyon Creek Ranch jerky treats or tenders, both produced by Nestle Purina PetCare Company and Milo’s Kitchen Home-style Dog Treats, produced by Del Monte Corp. Although no products have been recalled because no definitive cause has been determined, the FDA is reminding pet owners that jerky pet treats are not necessary for pets to have a fully balanced diet, so eliminating them will not harm pets. That more than 70% of children and 48% of adults confide in their dogs, according to the director of the Center for Human-Animal Bond at Purdue University’s College of Veterinary Medicine. Does your dog answer? That you might want to think twice about letting your dog drink from the garden hose. Many garden products, including hoses made from PVC, contain phthalates, a chemical used to soften plastic linked to birth defects and breast cancer, among other things. Lead may also be found in the hose’s brass fittings. Therefore, buy lead-free garden hoses, which are often white with a blue stripe, or rubber hoses. Store hoses in the shade to prevent the sun from heating them, which releases PVC chemicals into the water. That University of Arizona researchers have found that dogs, as well as humans experience a runner’s high. Dogs are also “hard wired” to run for pleasure, not just to capture prey or escape predators. The study showed that humans and dogs had higher levels of mood-altering chemicals after running, but not after walking. That 1 in 5 dogs suffer pain caused by arthritis, a chronic inflammatory condition similar to that in people. Arthritis causes limited mobility, painful joints and progressive degeneration of the affected joint. Although many cases of arthritis occur in older, overweight larger breed dogs, it can affect dogs of all sizes, ages and breeds. If your dog tires easily or lags behind during walks, limps or appears stiff after activity, is reluctant to climb steps or is slow to rise from a resting position, your dog could have arthritis. Consult your vet to make this determination and for pain management. That many dogs are afraid of the sound of fireworks. Many dogs that are afraid of thunder and storms are also afraid of other loud noises, including fireworks. If you use a thunder shirt for your Greyhound, consider putting it on your dog early on July Fourth. If you know your dog is afraid of loud noises, be prepared. Do not leave your dog outside alone when you expect to hear fireworks (and especially in this heat). If you are outside with your Greyhound, make sure your gates are closed and locked. Watch those fences as well – a scared Greyhound can jump a fence. Give those scared pups some extra love and assurance. TAGS wishes everyone a safe and fun July Fourth. Grasshoppers are out early this year. It must have been the mild winter. We can’t win for losing! Many people have had very good luck using Nolo Bait™ with grasshoppers and crickets (they don’t advertise this one but it works on them, too!) Flakes, easy to apply, non toxic to dogs, cats, birds, etc. Refrigerate the unused portion for later if you order a several pounds at one time. It keeps for months in refrigerator. Sprinkle around the perimeter of the house for the crickets. That, regardless of your age and circumstances, you should make arrangements for someone to take your Greyhounds and other pets in the event something happens to you. When you make a will, you take care of your children, your assets and your debts. Make sure you take care of your pets as well. Talk to friends and family in advance and make arrangements for someone to take your pets in the event something happens to you. You can make financial arrangements for the care of your pets in addition to their physical care. We all hope to outlive our pets, but you never know what is going to happen. Making those arrangements now may avoid confusion later and avoid your pets having to be placed back into pet adoption with someone they do not know. That the likely reason many dogs circle around a spot before they settle down to rest is because it is a residual habit from the days when wolf-like dogs lived in the wild, although no one knows for sure. Your dog’s ancestors had to sleep outside, in the elements, without warmth or safety. Walking around a spot was a way to stamp down grass, leaves or snow and create a soft, level surface — something akin to carving out a nest. After a dog circles, scratching at the bedding or carpeting before curling up is probably an ancestral behavior related to staying safe and comfortable. In extreme heat, digging a hole was a way to reduce a dog’s body temperature by surrounding herself with cool soil that could help regulate body heat. When it was cold — or even freezing — climbing into a hole allowed a dog to retain body heat and keep cozy. So why have our pampered house pets not evolved from these behaviors? Adaptive behaviors tend to linger long after they’ve lost their usefulness if there’s nothing to discourage them. Restlessness can be a sign of discomfort or even pain. If your dog repeatedly circles and digs but cannot seem to get comfortable, she may have a health problem. Observe your dog to see if she is having trouble getting up and settling down. If she is restless, take her to the vet to rule out pain and get a proper diagnosis. That coursing is the ultimate test of a Greyhound. Many people believe that open coursing across natural country is the only legitimate way to assess the true qualities of this magnificent breed. Where else can you see that thrilling explosion of the sprinter’s pace from slips to first turn over 300 yards? In coursing, the Greyhounds’ elastic agility and innate sense of balance is used to control and dominate the movement of its natural quarry (now an artificial lure). Many people who have adopted young, uninjured Greyhounds from the racing industry, have discovered that lure coursing is an exciting way to have fun with their hounds and give them lots of exercise. Many pleasant hours can be passed watching Greyhounds run to their hearts’ content!!! That human pain medication can be deadly to animals. Are you thinking about giving your pet an aspirin to ease its pain? Think again! Human painkillers including ibuprofen, aspirin and acetaminophen can be dangerous and even deadly to animals. Though acetaminophen can ease a human tension headache, even one tablet of 500 mg extra strength acetaminophen is dangerous for a dog. Human medications are not designed for the animal body and can have deadly effects when given to pets. Veterinarians can help prescribe the right dose and type of medication for your dog when he is in pain. For more information on animal poisonings, click on Greyhound Information and read the article, Common Animal Poisonings. That up to 80% of dogs that do not receive proper dental care may show signs of dental disease by age 3. If you notice that your dog has bad breath, extra drooling or pawing at his mouth, you dog may suffer from dental problems. It’s time for a dental evaluation by your vet. A thorough professional cleaning includes removal of plaque and tartar and evaluation of teeth and tissue. Anesthesia is used to keep the dog free of discomfort. However, there is a new non-anesthesia method of canine teeth cleaning. Check to see if your vet offers this alternative. Regular teeth brushing at home is the best preventative care. Other options include dental rinses, dental diets and dental chews. As you know, Greyhounds especially need good dental hygiene. Check with your vet about professional teeth cleaning and other options. Greyhounds have a personal space roughly the size of a dog bed or crate. Consider the life of a track or farm Greyhound: They are kept in dog runs or crates separated from other dogs by wire. No one invades their personal space when they are in their crates or runs. They can sleep without fear of being attacked (which in a dog’s mind may be the same thing as being touched when sleeping). Therefore, consider what a Greyhound’s reaction might be when touched while he is asleep on his bed. Such a move will startle the dog and the reaction may be to jump up or snap. Greyhounds are fed in their crates. They are not used to being bothered while eating and some consider that an aggressive move by a human. Children should be cautioned to stay away from a dog while he is eating. At the race track, Greyhounds are frequently moved from place to place by their collars (instead of using a leash) and are sometimes jerked by the collar for other reasons. Because of that, some Greyhounds are sensitive about having their collars pulled. The leash seems to have a different effect; therefore, the better idea is to attach the leash to the dog’s collar instead if you want to physically move the dog from one place to another. Always keep in mind what the Greyhound’s life might have been. Adoption into a loving family will definitely be a positive change, but even positive changes are still changes. Be patient. That dogs do not hug. Hugging is something humans do and children in particular. It seems that the first thing a child wants to do when meeting a Greyhound is to hug him around the neck. That is a foreign concept to a Greyhound. Other dogs do not hug them around the neck and if another dog puts his legs around another dog’s neck, that might be considered as an aggressive move and not well tolerated. They like to be petted or rubbed but not necessarily confined by a hug. Before joining an adoption group, Greyhounds are generally not shown the type of affection one would show a pet that is considered a family member. Remember a Greyhound has a prior history as a track or farm dog. Adults and children alike should slowly get to know their new Greyhound. Give the dog time to adjust to a new environment. A good rule of thumb is to let a new Greyhound approach you and give affection while the Greyhound is standing. Be patient. TAGS recommends that families with children who want to adopt a Greyhound read the book, Childproofing Your Dog: Complete Guide to Preparing Your Dog for the Children by S. Brian/Wilson Kilcommons. Unless the family has previously owned or currently has a Greyhound or other large dog, TAGS does not recommend that families with children under the age of 5 years adopt a Greyhound. Of course, each adoption is taken on an adoption-by-adoption basis. On November 18, 2011, an 8-year old Great Pyrenees was given a cutting-edge surgery at Texas A&M to treat bone cancer. Veterinarians used a specially designed microdrill to poke into the dog’s front right leg to inject radioactive cancer-fighting isotopes directly into the tumor. The current standard for treating osteosarcoma is to amputate the leg followed with chemotherapy. Osteocarcoma is the same malignant bone tumor seen in human children, which usually appears in adolescence, tending to occur in the shin, thigh and upper arm. These are generally the same locations where most osteocarcoma is found in dogs. The Greyhound type of physique is a perfect example of aerodynamic design. All members of the family share basic characteristics designed to enhance speed: long legs, narrow head, deep chest, sloping ribs, and long toes (and sometimes webbed feet). The narrow skull with very little stop between muzzle and forehead is less wind resistant than a square skull. The deep chest and sloping ribs allow for greater lung capacity and greater endurance. The long legs are self-explanatory: longer legs can stretch longer distances. The long toes can actually get a “toe hold” on the terrain. The shape of a Greyhound’s pads are often referred to as “hare’s foot,” because a rabbit’s foot is compact and long. All of the dogs in the sighthound group hunt by sight. Most dogs hunt by smell. A dog’s sense of smell is 50,000 times greater than a human’s. The sighthound’s sense of smell is no weaker, but they learned to rely on their eyes more than their noses. Greyhounds originated in the Middle East. The terrain was wide open and flat. The dogs needed to be able to see what was on the horizon and chase it down with blinding speed. The Greyhound is the fastest dog in the world. It has been clocked at 45 miles per hour on the straightaway. Greyhounds are also good at hurdling. In the early days of Greyhound racing the West Flagler Kennel Club in Florida hosted hurdle races in addition to flat racing. Almost 8000 years ago there was evidence of greyhound-like dogs living with humans. Greyhounds are the oldest pure breed of dog. They belong to the clan known as sighthounds. Greyhounds originated in the Middle East. 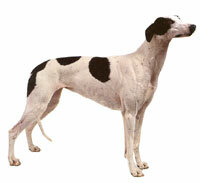 Other sighthounds are Basenjis, Borzois, Scottish Deerhounds, Ibizan Hounds, Afghan Hounds, Irish Wolfhounds, Pharaoh Hounds, Rhodesian Ridgebacks, Salukis, Italian Greyhounds, and Whippets. There are other dogs in this family in Europe and Africa: Chart Polski, Rampur Hound, Sloughi, Azawakh, Spanish Galgo, Khalag, Taigan, Cirneco Dell’Etna. Greyhounds are the only dog breed mentioned by name in the Bible. Feed your dog smaller meals more often (but not a larger amount of total daily food) – this helps your dog burn more calories and help minimize begging for food. Feed your dog less of its regular food each day. This is most effective with increased activity. Instead of feeding your dog less, switch him to a lower calorie food. The change should be gradual, mixing the old and new food over several days or weeks until you are only feeding the new food. A sudden change could upset your dog’s stomach. Give treats only on special occasions. Offer lower calorie treats or divide a larger treat into several smaller ones. Some low calorie dog treats are slices of apple, banana, carrot, melon, pear; green beans; and lean cooked meat. You might also try treats for smaller dogs (smaller treats). NOTE: Do not feed your dog grapes or raisins because they can reportedly cause kidney problems. You can help your dog become more active and lose weight by scheduling regular playtimes and walks. Not all games/exercise are appropriate for all breeds or medical conditions, so be sure to check with your vet before beginning a new exercise program. For walks, start out slowly to give your dog a chance to adapt to an exercise routine. Work up to a brisk 10- to 20-minute walk or jog once or twice a day. On hot or cold days, go easy or rest. running off leash in a restricted area, swimming, performing tricks (for low calorie treats), tug of war. According to estimates, 40% to 50% of dogs are overweight and 25% are obese. Obesity is more common in older, less active dogs. Dogs that are fed homemade meals, table scraps and lots of high calorie snacks are more likely to be overweight than dogs eating only high quality commercial pet food and healthy snacks. Obesity-related health problems may be heart disease, reduced life span, knee problems, labored or difficult breathing, fatigue, greater risk for heatstroke, diabetes, joint problems, immune system problems and pancreas problems. Check with your vet to see if your dog is overweight or obese, the probable cause, whether your dog should lose some weight, and what the best weight loss regimen is. The most effective weight loss plans usually involve increasing activity and decreasing calorie intake. Get veterinary advice before changing your dog’s eating and exercise habits. You want a safe, age-appropriate eating and exercise plan for your pet. When helping your dog lose weight, slower is safer. “Crash diets” and intense workouts are inappropriate for an inactive dog. If your dog gained weight slowly, losing it slowly will be better for your pet. That you should keep an emergency first aid kit in case your Greyhound is poisoned. The Poison Helpline number is 800-213-6680. There is a $35 consultation charge. That there is still plenty of time for a road trip before summer is over. Make it a fun trip for your Greyhound, too. There are many pet-friendly options for travelers. Make sure your dog’s vaccinations are current before you leave and that your dog wears a collar with identification tags. Ask your vet about health concerns specific to where you are traveling. Check www.officialpethotels.com for pet-friendly hotels. When you arrive at the hotel, allow your pet to examine and explore the new surroundings and stay with him until he settles in. If you must leave your dog alone in the room, hang the “Do Not Disturb” sign on the door and let the housekeeping office know not to enter while you are gone. Dogfriendly.com’s Top 10 dog-friendly cities are Portland, Chicago, San Diego, Seattle, Philadelphia, Minneapolis, Austin, Alexandria/Washington, D.C., New York and Indianapolis. Honorable Mentions: Charlotte, Dallas, Nashville, Orlando and Raleigh. Check www.dogfriendly.com for other travel information. Have fun and stay cool!!! Greyhounds can die from heatstroke! What is heatstroke? In simple terms, heatstroke occurs when a dog loses its natural ability to regulate its body temperature. Dogs don't sweat all over their bodies the way humans do. Canine body temperature is primarily regulated through respiration (i.e., panting). If a dog's respiratory tract cannot evacuate heat quickly enough, heatstroke can occur. To know whether or not your dog is suffering from heatstroke (as opposed to merely heat exposure), it's important to know the signs of heatstroke. 3. Use running water. A faucet or hose is the best way to wet down your dog's body. Never submerge your dog in water, such as in a pool or tub - this could cool the dog too rapidly, leading to further complications, including cardiac arrest and bloating. the dog is lying down, thus preventing the cooled blood from circulating back to the core. 7. Allow the dog to drink small amounts of water. Cooling the dog is the first priority. Hydration is the next. Don't allow the dog to gulp water. Instead, offer small amounts of water that's cool, but not cold. If the dog drinks too much water too rapidly, it could lead to vomiting or bloat. See a veterinarian. Once your dog's temperature begins to drop, cease the cooling efforts and bring the dog to a veterinarian as soon as possible. Your dog's temperature should be allowed to slowly return to normal once cooling has begun. A dog that's cooled too quickly may become hypothermic. Even if your dog appears to be fully recovered, the veterinarian needs to check to determine if the heatstroke caused any damage to your dog's kidneys and liver. The effects of heatstroke can continue for 48 to 72 hours longer, even if your dog appears normal. According to Grant, the most common cause of death following heatstroke is disseminated intravascular coagulopathy (blood coagulating throughout the body), or DIC, which can occur hours or days after the heatstroke episode. DIC can also be caused by pyometra or septicemia, but Grant says heatstroke is the most common cause. "Once a dog develops DIC, it may bleed in the thorax, abdomen, nose and intestine," Grant says. "Once the blood-clotting factors are consumed, there is an inability of the blood vessels to prevent leaking; the condition is almost always fatal." For this reason, follow-up veterinary care is essential following a heatstroke episode, even if your dog seems to be completely fine. Prevention is the best medicine The best treatment for heatstroke is prevention. Especially during the summer months, it's essential to be aware of the potential for heatstroke. Knowing the signs of heatstroke, and taking the necessary steps to prevent it, will ensure your dog can have a safe and active life year-round. That you should watch what your Greyhound drinks. Alcohol is absorbed into the blood stream rapidly and can affect pets quickly, causing a dangerous drop in blood sugar, blood pressure and body temperature. Caffeine can affect the Greyhound’s heart, stomach, intestines and nervous system. Xylitol, a natural sweetener used in many sugarless gums and candies, is toxic to dogs. That you should NOT give your Greyhound “just a bite” of some table foods. Cocoa and chocolate contain Theobromine, a chemical that is highly toxic to dogs and cats and can cause seizures and affect heart rhythm if ingested in large amounts. Grapes and raisins can damage your Greyhound’s kidneys. Onions and garlic in any form – even powdered - can endanger your Greyhound, from mild gastrointestinal upset to severe anemia. That your garden may pose a danger to your Greyhound? Blood meal, used as organic fertilizer, is flash frozen animal blood that has been dried and ground. If a large amount is ingested it can cause vomiting, diarrhea and severe inflammation of the pancreas. Bone meal, another organic fertilizer, is made from animal bones that have been ground to a fine powder. When ingested, bone meal can form a large concrete-like obstruction in the stomach that could require surgical removal.